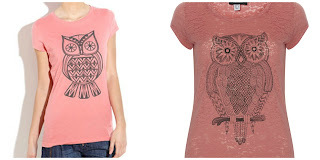 While I probably had various items of clothing with birds on them while growing up, I remember my current love starting when I was in first year of college and got a bright pink Dorothy Perkins t-shirt with an owl on it. I've owned many more since, includes these two from New Look and Primark which I still own and wear. The selection above are some of my favourite bird items. 1. Starting clockwise from top left, I got this bag from Vendula London and it served me well for years! And I got many compliments when I used it too. 2. The next is a robin scarf I bought from Penneys (Primark) years ago and I hope I can find it again because it wasn't in my scarves bag when I looked earlier! 3. This Penguin books badge was bought at Ziferblat in Edge Street, Manchester during a market and was made by Jon Turner. Though it was bought more for the nerdy book factor than the bird factor! 4. These robin socks are my latest bird purchase, I bought them in Penneys (Primark) last week so run if you want them! 5. This parrot bird branch was a piece of jewellery I've inherited from my grandmother and I must wear it more. I need to add more parrots to my collections! 6. Finally this puffin mug was bought in Asda during the summer and it's just so damn cute! If you've just looked at the above and you know me well enough, you're probably thinking 'But Breige, where are the flamingos?'. They get their own section. Bring on the flamingo madness!! The first scarf is a children's snood I bought in Penneys (Primark), even though it was for kids I couldn't resist it! The second one is a Penneys scarf too and the third was a gift from my friend Sarah as she knew I couldn't have too many flamingo scarves! 1. This was an oatmeal coloured top with outlines of flamingos that I bought in Primark in Liverpool. I coloured in the flamingos with pink fabric paint but only on the front body part, I left them untouched on the sleeves and the back. 2. My wonderful sister bought me this lovely Pink Lining flamingo purse, it has lovely rose gold on the inside. I know it's something Cherry Sue would love!! 3. This necklace was bought a few years ago in Dorothy Perkins. 4. I bought these Vans on eBay, I just HAD to have them! I also had a matching bag but gave it to my sister to share the mingo love. Finally some more flamingo bits and pieces. 1. This amazing cross stitch decoration was made by Sharon from Behind Green Eyes and I am still in awe of it almost a year on! I can not wait to bust it out again for Christmas this year, it's just incredible! 2. Not going to lie, when I was in Belfast in 2013 I only wanted to go to Ikea for these flamingo glasses! Worth it! 3. Flamingo lights from Penneys. There was so much cool flamingo stuff this year in Penneys, even bedsheets that I wanted, but I played it cool and got these lights (and my sister also got me some as well). 4. Finally a shot of me in Liverpool in 2013 with my boyfriend and our friends, me enjoying my flamingo sunglasses I bought from Primark as well as my flamingo snood! Phew! 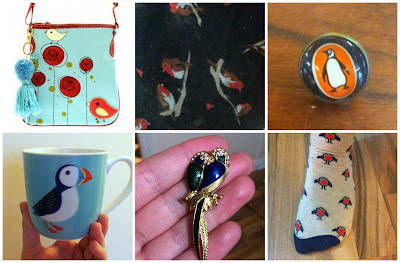 So many birds and if I went rooting through my stuff, I know I'd find a lot more items I could show.